Gym etiquette question: is it ok to strip off your (extremely) sweaty t-shirt, towel down your naked chest as if you’ve just got out of the shower and then re-dress (admittedly in a clean shirt) before hopping onto the next bit of equipment? I hasten to add that this wasn’t my behaviour, I just found it a bit disconcerting at 8 o’clock in the morning. Yes, I have gymmed. Five minutes of unbearable boredom on the treadmill as a warm-up, followed by 15 minutes random hills on each of the the bike and the elliptical thingy. All this was whilst listening to the Cool Britannia episode of Stuart Maconie’s The People’s Songs. I’ve really enjoyed dipping into this series (I ran in the snow listening to the skiffle one during Janathon) and this one made me all reminiscent for 1997. Regardless of politics, this was my post-A-levels, turning 18, not a care in the world summer that by law has to be remembered through a haze of sunsets and kittens (in reality a haze of Strongbow and Guinness, but it’s much the same). As I pedalled and pushed, I pondered on what 18-year-old me would make of 33-year-old me. I suspect that she would be a little freaked out by the running, but otherwise would be quite relieved by how things have turned out. Conversely, I suspect that 33-year-old me would tell 18-year-old me to slow down on the ale and pies so that I would have less of a beer gut to deal with in my thirties. I could illustrate this post with a sepia-toned photograph of myself in the late 90s, but I won’t. 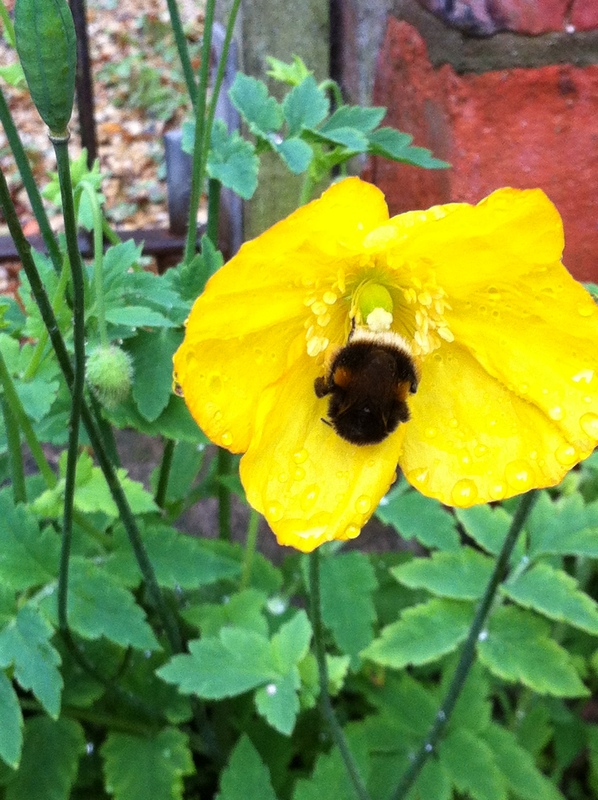 So here’s a bee on a poppy instead. Lol. I daren’t think about what i would think of me. I take it that it wasn’t you stripping off? Boo! Bees on poppies are all well and good but a sepia teenaged you would be far more entertaining. I would probably nip to the loo to change shirts but only to save the blushes of other gym users like yourself. As long as the chap (I assume it was a chap) didn’t pause to admire himself in the mirror, I wouldn’t see it as much different from the tennis guys changing shirts on court mid-match.